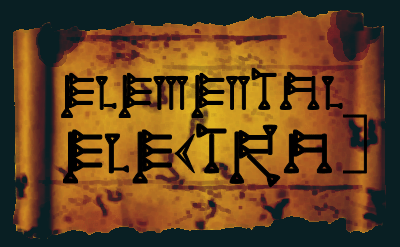 Before using the elemental spell books you will need to learn about elemental magic and which Electra spells are available to the elemental path that has been chosen. Only a very experienced elementalist can create electra spells outside of those in the elemental books. Ingredients:Thin iron rod, dried wood chips. Procedure: Roll wood chips against iron rod, then flick chips at target, concentrating on the increasing heat caused by the friction. Result: Properly prepared, an experienced cast will cause the chips to shoot forward, sparking and shocking the victim painfully. It is difficult to keep from being mildly, or painfully shocked when casting this electra spell. Ingredients: A sea shell full of ground iron chips, and wood dust. Procedure: Shake the shell and focus on heating the contents within. Result: With enough time and concentration, an invisible shield will surround the caster. Any who try to pass through it, or press a metal weapon to it, will be severely shocked and repelled while the caster holds his concentration. If concentration falters the shield will collapse, and can cause painful shocks and burns. Ingredients: Thin iron rod, a piece of wool. Procedure: Grip iron rod tightly with wool, rub it vigorously up and down, pointed in the intended direction. Result: A powerful caster with great experience will loose a potent bolt of lightening in the direction of the target capable of stunning, paralyzing, severely burning, or even killing them. No matter how proficient and experienced the caster, they will suffer extreme fatigue, and disorientation for hours following the spell. In some cases the caster may misdirect the cast, and stun, or burn himself dangerously. There are several copies of the original elemental books and scrolls containing the ingredients, and in depth procedures concerning each spell.